For many decades, companies have followed linear sales models based on the assumption that resources are abundant, available, easy to source and cheap to dispose of. However, natural resources do not follow linear cycles. The circular economy is a concept that promotes the reuse and recycling of goods with a goal of “zero waste”. In order to building towards a circular economy, it requires new concepts that either replace existing ones or seize new opportunities. Innovative business models such as Chemical Leasing accelerate the shift to the Circular Economy, because they are characterized by thinking about chemicals sales from a zero-waste and holistic life cycle perspective. 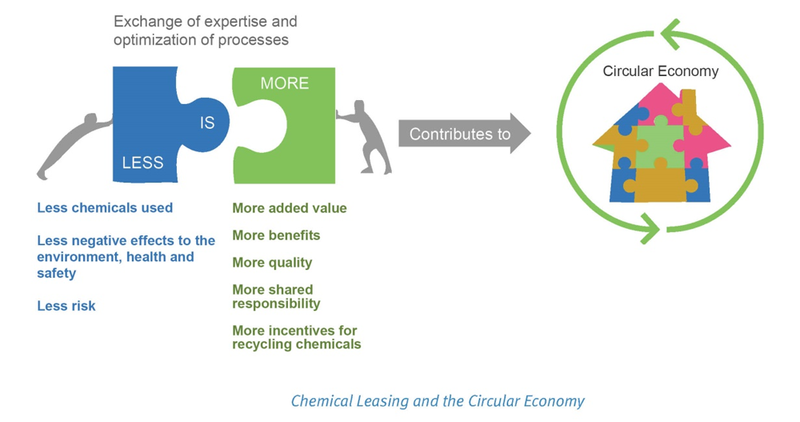 Chemical Leasing contributes to the Circular Economy by establishing closed loop systems, enhancing know-how exchange between business partners and incentivizing resource efficiency (illustrated in the Figure below). For more information on the circular economy, see http://ec.europa.eu/environment/circular-economy/.